Leadership Development and Strategic Planning – these are keys to success and core services provided by my business. Individuals, teams and for-profit, government and non-profit organizations – everyone wants a plan for future well-being. Everyone has the same concern: How can we ensure that we come up with an achievable plan that will actually get implemented? I believe there are at least five key elements for leading yourself and others to achieve On-Purpose results, whether through personal leadership, as part of a team, or if your aim is to help your organization grow. To illustrate these qualities, I like the “Archer analogy”, shared by Mark Winton, owner of an electrical manufacturing company in South Africa. When you have all of these elements you have a rare combination of purpose and meaningful action necessary to arrive at The Intersection of Purpose & Now. Having “Vision” alone is like saying “I want to be an Archer!” So what’s the plan…will you simply run at the target with arrows in your hand? 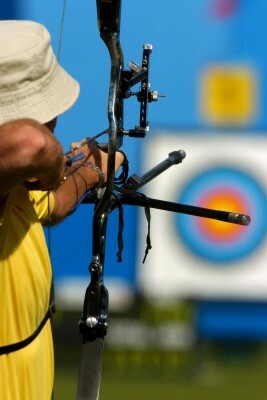 Pick up your powerful bow and your sharpest arrows with the straightest of shafts. Take aim and hit your target. Win! Success is the continual achievement of your own pre-determined goals, stabilized by balance and purified by belief. This entry was posted in archer, intention, leadership, Purpose, strategic planning, target, vision. Bookmark the permalink.